The purpose of this information is to learn how to minimize and prevent the complications that can accompany diabetes mellitus. Specifically, this document relates to foot and leg issues but many of those principles are equally necessary to prevent kidney disease, loss of vision and male sexual dysfunction. There are no gruesome pictures here our focus is on keeping you healthy. Studies have shown that diabetic people who actively understood education similar to the information here were 50 % less likely to have a bad outcome. Up to 75% of amputations are avoidable if care is given before any ulceration occurs. But knowledge is only a part of the plan – there must be a corresponding change in your behaviour to gain a benefit from it. Ultimately you, and only you, are responsible for your health and can bring about healthy changes. Vision impairment – Can t see feet to assess problems- Indicates small blood vessels may be diseased. Neuropathy a loss of sensation that is twice as important a predictor ofamputations as vascular disease. Neuropathy – What is it? Podiatrists use a simple and painless method to check nerve function in the clinic. Neuropathy is a decrease in the ability of the body s nerves to function properly. It can be due to poor glucose control or compromised blood flow to the nerves. There are three kinds of nerves, sensory, motor and autonomic, which will be detailed below. Diabetic neuropathy is usually symmetrical, involves the feet more than the hands and is progressive – it worsens with duration of the disease. As its progress is often not noticed, it is underestimated and underemphasized. It is the biggest single predictor of amputations. These are the nerves that report feelings, temperature, touch, pressure and pain sensations back to your brain. Sensory neuropathy may result in paraesthesia where the brain interprets ordinary sensations like touch as painful. This is worse at night and at rest and is relieved by movement. Standard tests for sensation will be nearly normal. Sensory neuropathy can also cause anaesthesia where sensations are dulled or not felt at all. This is obviously not painful but position sense and balance are affected. Sensory neuropathy can make injury more likely as your normal protective responses don t occur (for example pulling back a body part that is being burned). It can lead to an injury not being noticed and therefore not cared for (such as a splinter in the foot not removed and walked on for days). It can stop your immune and repair systems from detecting an injury and coming to fight infection or repair the skin properly. Neuropathy at the motor (movement) nerves can cause muscles to wither and waste away, which causes muscle imbalances and bony joint deformities. This is why claw toes are so common in the diabetic foot. Walking style will change and areas of excessive pressure will be found under the feet. The autonomic nerves control the things you can t consciously do, like beating the heart. In the feet, they control sweating, blood flow and healing. Loss of sweating leaves feet dry and cracked and open to splitting and infection. The fat below the skin, which is a bouncy protector, wastes away. When blood flow is not properly controlled, the blood flow can take a shortcut that misses the toes. This reduced blood flow means lack of oxygen to that skin and tissue and puts it at risk. Veins may appear prominent. The body may fail to respond to repair injury or infection because it doesn t notice it is there. Your podiatrist or doctor should listen to the arteries at regular intervals using a Doppler ultrasound machine. A lot of information can also be gained from a visual inspection of the foot. Typically, a foot with poor blood flow will have little or no hair, shiny skin, thin skin with a loss of fat below the skin, poor pulses and colour changes. The foot will be pale when elevated and mottled red/purple when hanging down. Cholesterol plaques in arteries occur more quickly in diabetics as retention of fat within artery walls is increased and glucose in the blood makes the collagen within artery walls stiffer. Arteries then are more likely to have the irregularities that first allow blood to clot within the vessel. Blood clots within vessels can come loose and cause the death of any tissue downstream of the blockage. This might be a toe, a section of lung, heart (heart attack) or brain (stroke). Even without a clot, thickening of artery walls reduces blood flow to tissues, reduces oxygen to skin and flesh, limits antibiotic medicine and white blood cells from getting to infections and delays or prevents healing of wounds. The most common structural problems in the feet are retracted or clawed toes, bunions, prominent metatarsal heads (the knuckles on the bottom of the ball of the foot) and areas of increased pressure that lead to corns, callus or ulceration. Those with diabetes can suffer from glycosylation of collagen. This means that the abnormally high blood sugar causes the soft tissue, things like skin, muscles and joint capsules, to stiffen up and contract. Toes will tend to become deformed and the bouncy fat beneath the skin thins down which makes the skin more easy to damage. All feet take a lot of pressure in daily life and these issues can increase that pressure 500% in some spots, creating pressure areas which may break down or become ulcerated. Podiatrists make shoe inserts that can either make the foot function better or deflect the pressure away from problem areas, preventing or healing ulcers. There is a kind of arthritis found almost exclusively in diabetics called Charcot s disease. It occurs when the nerves that run into a joint lose the ability to report back to the brain and the brain is unable to sense when the joint is being used incorrectly. This can result in the joints, particularly one just below the ankle, being destroyed. There is a long build up to Charcot s disease but the damage occurs very quickly. A joint can go from working fairly normally to being ruined in one day. If you suffer from neuropathy in the feet, you must see your podiatrist and have foot function assessed. If no damage has occurred yet, a foot insert called an orthotic can dramatically reduce future damage to the joints and make a Charcot s episode unlikely. If it is too far advanced, an orthotic can help to make the position in which the foot will be permanently frozen a better one. If the foot is already trapped in a bad position, parts of the foot will be bearing a lot of pressure. A different type of orthotic can be used to make these pressures more normal. What will the podiatrist assess? Pulses. Often assessed with an ultrasound unit. Skin. Texture, hair, pressure marks, corns & calluses, temperature. Footwear: too tight or too loose? inappropriate? pressure marks, wear marks. Gait: altered walking creating pressure areas? Standing. What do the feet do when weight bearing? Range of motion. Are any joints restricted and at risk? Dry skin leads to cracks and allows bacteria to enter through the skin which should be the body s impenetrable barrier. This is a common cause of infection in the foot and infections here tend to run deep due to the way fat in the heel pad is organised into columns. Dryness will affect most diabetics eventually as nerve disturbances cause sweat glands to stop functioning normally. It should be noted that soaking your feet in water will make them more dry. Urea products are recommended to treat the dry skin. Discuss the strength required with your podiatrist. Avoid chemist lines with a greasy base as they fail to penetrate the skin well making them less effective and could cause falls. Footwear can protect against injury or be the cause of it. The task of shoes and insoles is to decrease the peak pressures ( pounds per square inch ) experienced by the foot. Running shoes for example can lead to reduction of pressures by 45% compared to harder soled shoes. Shoes should be comfortable straight off. Buy shoes later in the day when your feet are bigger due to swelling. Have shoes fitted. If sensation is affected, you may not be able to properly assess the fit. Stand when trying on shoes as feet are longer when standing. Expensive doesn t automatically mean good. Depth shoes are available at specialty shoe shops. They are higher in the toe box allowing more rooms for toes. Shoes won t stretch where they are stitched. Avoid stitch lines over any bony protrusion. Wear Thor-Lo socks for long walks and long periods of standing. Don t buy off the shelf orthotics. Seek advice from your podiatrist. Wear new shoes only 1 hour the first day. Visually examine feet immediately on taking off for red pressure areas. Build up slowly. Feel inside shoes before putting on. Items may have fallen into shoes (surprisingly common) or shoe nails or lining may be protruding or torn. Throw out socks with holes. Don t darn them. Throw out shoes with holes in the lining. Socks shouldn t be too small or too big. Wrinkles can cause blisters. Shoes that are too big are just as dangerous as shoes that are too small. Trace your standing foot and check against shoe sole. Alternate shoes during the day (if you have sensory deficit). Shoes should be nearly 1 cm longer than toes and the widest part of your foot should be in the widest part of the shoe. podiatrist may also re-pad the tongue of the shoe for better fit. Shoes should not have an apparent ripple across ball of foot but you should be able to generate some spare material with sideways thumb pressure. Most shops will allow you to show your new shoes to your podiatrist onapproval . The most important person in this process is you. Your podiatrist will see your feet every couple of months. Your doctor may (or may not) examine your feet every few months, years or never. You, however, see them every day. If they have a problem, you will be the first one on the scene. Up to 75% of amputations are avoidable if care is given before any ulceration occurs. But knowledge is only a part of the plan – there must be a corresponding change in your behaviour to gain a benefit from your knowledge. Ultimately you, and only you, are responsible for your health and can bring about healthy changes. Inspect your feet daily, top, bottom and between the toes, using touch, sight and mirrors as necessary. Wash feet daily and dry well between toes, taking care not to rub skin off. Have corns and callus regularly removed. Pressure on foot at site of callus is 30% less after removal of callus. The more callus there is, the faster further callus will form. Wear orthotics if prescribed for you. Do address dry skin with an ointment recommended for you. Learn how to cut nails. If your nails are not perfectly normal seek advice from your podiatrist. If normal, cut nails following curve of toe, don t change the angle to cut down the side. Know who to contact if there is a problem and when. Tell your carers, particularly your podiatrist, that you have diabetes. Control blood pressure. Those with good blood pressure control have 24 % less risk of amputation, 32 % less chance of diabetes related death and 50 % less loss of visual perception than a comparable group with poor control. Keep blood fats under control through diet, drugs and maintaining healthy weight. Exercise regularly to prevent weight gain and assist in improving circulation. Ask your doctor if you need daily aspirin therapy. See a podiatrist at least once a year when healthy or more often as advised. Have eye and kidney examinations as they can indicate problems in feet and vice versa. 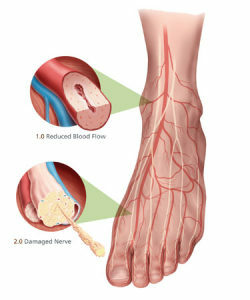 Don’t smoke, it causes a big drop in blood flow to the toes. Don’t Don’t Don’t use chemist corn cures or self treat calluses or ingrown toenails. Just don’t! Don’t go barefoot outside (everyone) or inside (if neuropathy is present). Don’t dig out hard skin at nail edges. Corns in nail edges are very common and easily infected see a podiatrist for removal. Beware of temperature extremes. Don t use hot packs or cold packs, don t put feet close to radiators or fires, don t get sunburned and be aware of what surfaces might be hot. Remember how hot the sand used to get when you were a child? Concrete paths, balcony rails etc are still just as hot and can cause a severe burn, even if you can t feel it. Don t test water temperature with feet or soak in a hot foot bath. Don t soak in any foot bath. Don t go barefoot inside or out. Don t use pumice stones. Be wary of ripping skin with strong sticking plaster. Don t use garters or socks so tight that there is a visible mark on removal. Inspect shoes before putting on every time.